With the 2019 purchase of soundproofing company Sonic-Shield, New England Soundproofing becomes one of the largest full service soundproofing companies in the US. New England Soundproofing of Easton, Massachusetts has taken its two-year old partnership with Sonic-Shield LLC of Port Richey, Florida to a new level by acquiring the company in an asset purchase agreement. New England Soundproofing immediately gains an expanded footprint by acquiring Sonic-Shield’s national marketing reach and customer base while Sonic-Shield benefits from the manufacturing synergies provided by New England Soundproofing for their rapidly growing national brand of REVRB ™acoustic panels. Additionally, to expand their east coast footprint focusing on commercial and residential sales, New England Soundproofing has created a new division, also based in Port Richey, called Florida-Soundproofing. This aquisition is the largest to date by New England Soundproofing, as they still continue to grow! See full story in our press release. Boston City Council is exploring ways to lessen the impact of “unreasonable and excessive noise” on the city’s residents. City Councilor At-Large Althea Garrison filed an order last Wednesday for a hearing to discuss better managing Boston’s noise levels and amending the City’s code. Garrison said in an emailed statement that in order to preserve the safety and wellbeing of Boston’s constituents, the City Council must work with other departments to improve the city’s laws on noise. A residential ceiling soundproofing that because as complete and perfect, yeilding high satisfaction. He even wanted everyone on the internet to know! To see his project, click here! I recently had New England Soundproofing complete work in the master bedroom and guest room in my condo, hoping to limit some of the noise coming from our upstairs neighbors (our neighbors are great and very respectful, but our building seems to amplify even small sounds). In short, I'm very happy with my experience working with NES and, more importantly, with the results. The whole team was really great to work with - no pressure to move forward with the project after they completed the estimate, they were very helpful and accommodating when it came time to schedule the project, and the guys who did the actual work were reliable and conscientious. Now that the project is completely done, I'm happy to say that NES's soundproofing system works really, really well. Between the acoustical insulation, the decoupling system that "disconnects" the ceiling from the joists, the rubber sound barrier, the acoustical caulk, and the double layer of sheetrock the sound difference is dramatic. Whereas before we could actually hear our neighbors snoring and their phones ringing, heavy footfalls and airborne noise from upstairs are now barely noticeable. It's a huge relief. Long story short, if noise from neighbors is affecting your quality of life, this is the way to go. PROS - Everyone at NES was very responsive, professional, and great to work with. - They completed the work ahead of schedule (they estimated 5 days of work, but were done in 4). - The results are really good. We tried basic/budget soundproofing (additional insulation, heavier sheetrock) at my last place and it didn't make any difference. This system actually works. - To keep costs down, we had a standard general contractor complete the ceiling demo at the start of the project and the reinstallation of the ceilings after NES did their thing. NES worked with our contractor directly to make sure he knew the best practices for installing the heavier sheetrock and Green Glue. CONS - It's not cheap. That's not to say it's overpriced, it's just that the materials and the per hour cost of acoustical specialists is more than your run of the mill home improvement project. But, if your budget allows it and/or you really need relief, it's worth it. - Yelp! New England Soundproofing was featured on the front page of the Boston Globe's July 3rd issue, discussing the issue of soundproofing in the Boston area. For the full article, click HERE! One of the things that we missed completely when opening up our new restaurant, was the sound. It's just something you don't think of! Our beautiful restaurant is adorned by reclaimed wood, piping, copper, reclaimed brick and industrial-type fixtures; all of which are hard surfaces. This caused even the slightest busy evening to be VERY noisy. It was pointed out to us that we should invest in sound absorbing panels -- WHAT ARE THOSE?! After much research, we came across New England Soundproofing. We gave them a call and were put through to Joe Drago. Joe instantly knew exactly what we were talking about, and with his expertise and knowledge, made us feel that New England Soundproofing was the way to go. Joe personally came to our establishment and started measuring the space, and told us exactly what we needed without any overage. "I'm only going to suggest what you need." And Joe was absolutely right!! Joe's team had a limited time frame of when they could work, due to the fact that we are open for lunch and dinner, and we didn't want to disturb our guests, but in 2 days, all of the panels were in. The first day, when only half the panels were installed, you could already hear a huge difference! By the time the job was finished, it was truly like night & day. Our guests immediately started praising us for moving forward with the sound panels, and one guest in particular said, "The only reason I came back to visit with you again, is because of your post on social media, stating that you had your sound panels installed!" We were so glad to hear this. One of the best parts? You can now clearly hear the awesome playlist that we have playing in the background! ;) 100% totally worth it! Thank you so much to New England Soundproofing for a job well done! Your work even brought a guest back to us! I wanted to take a moment to thank you and your teams for the tremendous work they were able to get done last week here, soundproofing the bedroom wall at Jack Flats. The resident told me today she notices a huge difference. I do appreciate all the hard work and dedication to this project, Although it was not too large a project, it definitely was an extremely important one for us..
New England Soundproofing not only provides customers with the best soundproofing materials available, we also provide customers with the best in-house installation crew. Every aspect of work we do for our customers are closely monitored, as we make sure every project is properly done. We provide a turnkey solution to allow for the best results. New England Soundproofing's systems have been tested, installed, and proven to work time after time again. The Boston Herald and The Boston Herald Radio featured New England Soundproofing in the September 10th and September 14th Boston Herlad Newspaper. New England Soundproofing was featured based on the outstanding project that was done for the Boston Herald Radio, and how New England Soundproofing was able to reduce the echo and increase the satisfaction of the radio hosts. New England Soundproofing also custom-built a green screen out of the REVRB Acoustic Panels. To see more information on the project, click HERE. To read the September 10th article, click HERE and to read the September 14th article, click HERE. New England Soundproofing was featured on the front cover of the JLC (Journal of Light Construction) January 2015 issue. JLC focused the article on our products and procedures for walls, ceilings, and floors. The article talks about the specific products used, such as Sound Barrier MD/HD, Quiet Walk, Sound Clips, and many other tips and tricks we use when we install! New England Soundproofing is proud to be featured in this prestige magazine. Pick up the January issue or see the article by clicking HERE. JLC Magazine has been around for over 30 years, providing residential and light commercial contractors with practical jobsite advice on what works, what doesn't, and why. For more information, contact New England Soundproofing at 781-710-1261! Multifamily Executive Magazine (MFE) needed advice for quick and low cost soundproofing options for their magazine and online article, Keep It Down: Soundproofing Products That Wont Break The Bank. New England Soundproofing was interviewed by MFE on what the best, most inexpensive ways of soundproof (link to article above). 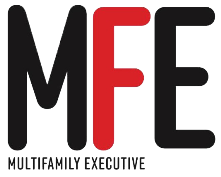 The high quality and high experience that New England has to offer made MFE writers come to us for the most professional options on soundproofing. New England Soundproofing not only leads in sales for soundproofing materials, but also does the in-house installation of the products, making sure everything is perfectly installed and the clients are happy. To read an online version of the article CLICK HERE! 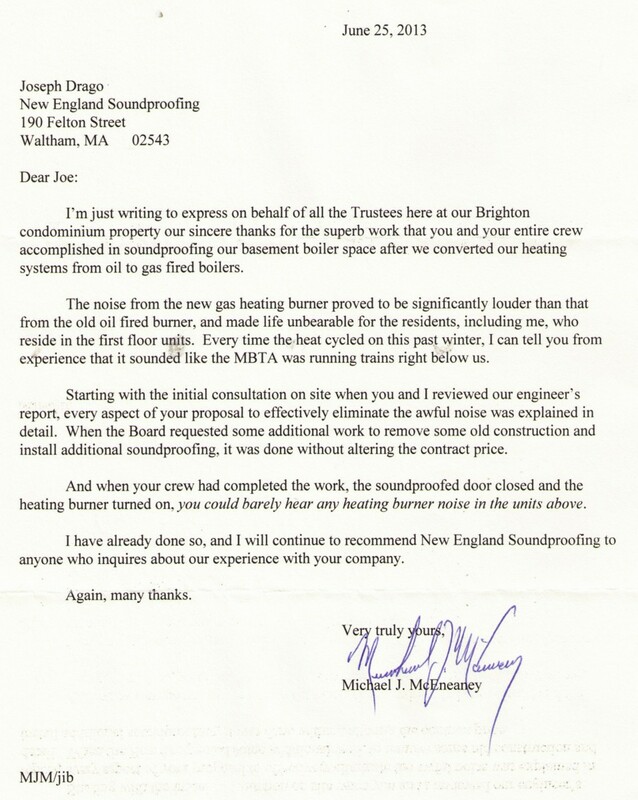 I am writing to let you know that the we are very pleased with the NE Soundproofing System installed in our first floor condo in Somerville. The sound (voices, TV, music) coming from the unit above ours has been substantially reduced, we basically don’t hear any airborne noise now! The insulation also provides acoustic comfort from squeaky floors and footfall noise, which have been a sore point in an otherwise wonderful home. I also wanted to thank you for your availability during the installation phase, we truly appreciated how promptly and professionally you responded to our request to consult with our contractor. I would gladly recommend New England Soundproofing to anyone who is looking for a serious residential soundproofing company. New England Soundproofing takes pride in the soundproofing materials we provide, allowing for homeowners and other contractors to install it themselves. For any questions on soundproofing materials, trust New England Soundproofing. 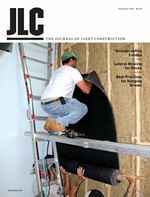 New England Soundproofing was featured in JLC (Journal Of Light Construction), a 32 year-old magazine that provides residential and light commercial contractors with practical jobsite advice on what works, what doesn't, and why. JLC heard about the prestige soundproofing work that New England Soundproofing has been doing for several years and wanted to include it in the magazine. New England Soundproofing went through a complete wall soundproofing project with JLC to show them the proper steps and solutions to help reduce the noise coming through shared walls, most commonly in town homes and condos. For complete project details, CLICK HERE or visit the JLC website to see the project, by CLICKING HERE! New England Soundproofing Takes Pride in the great success and satisfaction that our products bring to our customers. Our top product, Acoustic Panels, have had such great success in the past that we have full confidence that they will reduce the reverberation within the room. After installing them in The Lanes Bowl And Bistro, we knew that the customers of the restaurant would be happy. 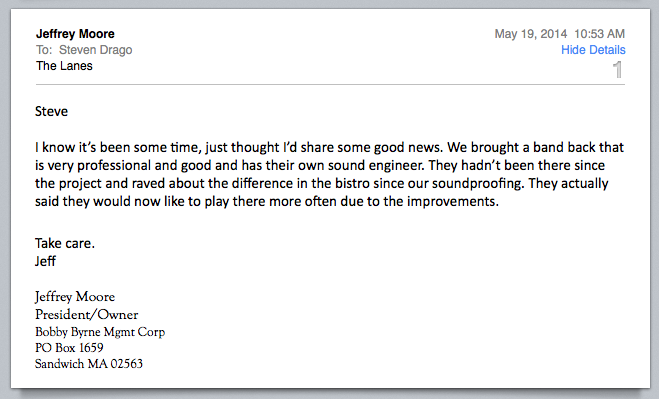 Months later, we received an email from the owner stating not only that the customers are happy, but the bands that play there are happy with the acoustics, and will continue to book there! Our Acoustic Panels have been proven to work and are continuing to do so. To see the full project, CLICK HERE! New England Soundproofing was interviewed for an exclusive article that was in the April 23, 2014 issue of The Boston Globe. New England Soundproofing had such great success with soundproofing in restaurants around Massachusetts that The Boston Globe wanted to know the secrets and “know how” to properly reduce the noise within a restaurant. The article explained some of New England Soundproofing projects, including The Lobster Trap, and The Painted Burro, showing how significant the acoustic panels can reduce the noise so that customers can be satisfied. To see the full article, click HERE for the online version, or visit our Restaurant Acoustic page to see more information about the article. 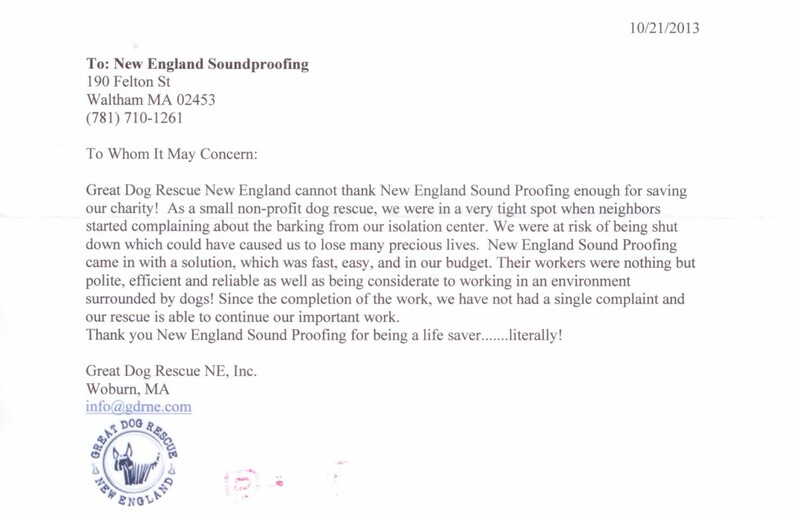 At New England Soundproofing, We Take Pride in the work that is done with our customers. Our one-on-one approach allows us to find out exactly what we have to do to satisfy the customer. New England Soundproofing takes pride in the positive image and perfect work that we provide. For high end installs and high end soundproofing materials, call us today and find out how you can stay peaceful in your home or business. Mass Realty - one of most popular real estate websites in Massachusetts, wanted to learn more about the art of soundproofing a home. After many honorable recommendations from customers, Mass Realty chose New England Soundproofing for an article on The Art of Soundproofing Your Home, which included tips and ways to help soundproof anyone's home, condo, or office building. New England Soundproofing is a high end, full soundproofing company that does consulting, sales, and installs for clients all over New England. To See Full Project Details, Click Here! To See Project Click Here or On The Image Above! "Thanks for a job well done. Your workers were great! The preparation beforehand was thorough, the clean-up after the job complete, and the painting fo the room, by Barry, perfect. What we anticipated was going to be a messy and troublesome job, turned out to be most pleasant (for us). 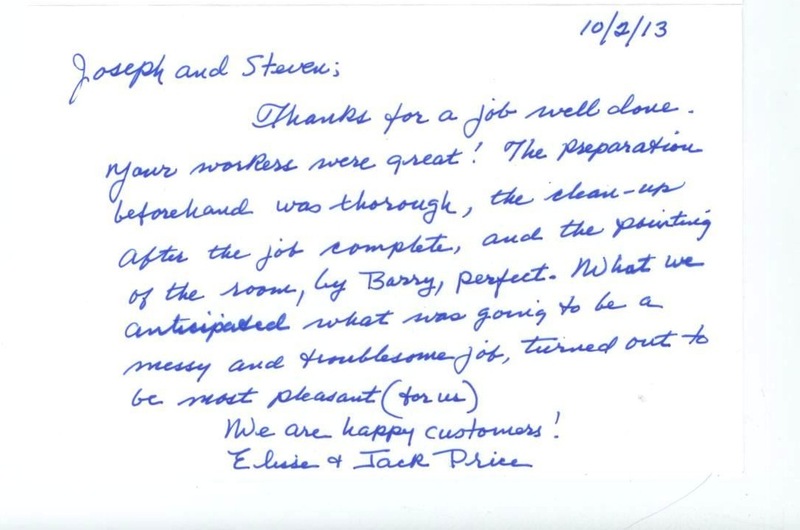 We are happy customers!" Can You Hear Me Now? New England Condominium Magazine has done another article on the importance of soundproofing in condominiums. They talked about how current condominium buildings have not been built with the right soundproofing material, and how New England Soundproofing can provide condo owners with the most appropriate and cost effective soundproofing material. This article interviewed head consultant Joseph Drago about what it really takes to soundproof your condo and the importance of getting builder, architects, and developers to know that there is an easy cost effective solution to soundproof the buildings. New England Soundproofing has been successfully soundproofing condominiums for over 10 years and have proven that there is a solution for any sound issue. Click HERE to read the article. To see the project, CLICK HERE or on the image above. Zagat, online blogging site that provides trusted and accurate restaurant ratings and curated restaurant reviews for thousands of top restaurants worldwide, looked into the "Secrets of Restaurant Soundproofing" and reviewed The Painted Burro Restaurant on how the acoustic solution in the restaurant made a large improvement to the dinning area. Zagat stated that Restaurant Soundproofing and absorption is a much-needed solution to the loud dining areas. Restaurant owners saying that customers, "Appreciated the new artwork, and they didn't realize it was soundproofing." To see the Painted Burro Soundproofing, click here or visit our Restaurant Soundproofing section. 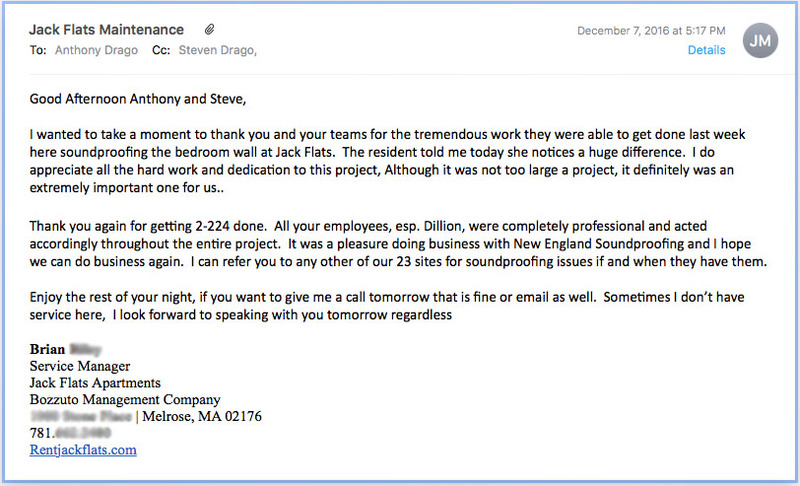 Customer satisfaction is what New England Soundproofing fulfills as we see another successful project just get completed. New England Soundproofing has recently installed Acoustical Panels in The Painted Burro, a restaurant in Somerville, MA. The outcome was perfect as bloggers who have complained about the noise issue, came back and were satisfied with the outcome! One blogger quotes, "During brunch, the sound levels were very manageable and there was no difficulty in talking to anyone at our table. The sound proofing seems to be doing its job." As another blogger says, "there was a noticeable difference in the noise level...the panels are very unobtrusive, and blend well into the decor." 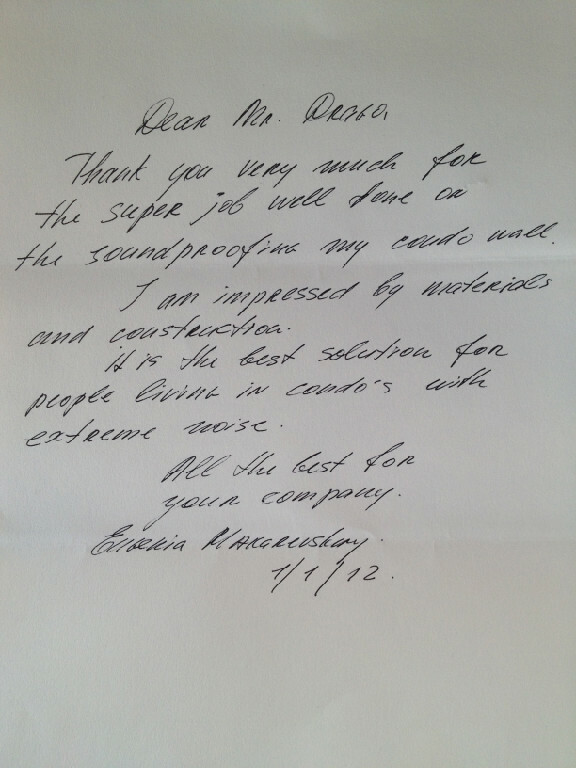 It is always nice to see positive feedback not only from our customers, but also their customers. To see The Painted Burro project, click here! New England Condo Magazine, the largest condo-based magazine in Massachusetts and New England, had interviewed New England Soundproofing on how well and essential soundproofing is to its condo owners. New England Condominium Magazine is a monthly publication that addresses issues of importance to the cooperative, condominium and HOA communities. With nearly two decades of existence and based out of NYC, they asked New England Soundproofing for their expertise in soundproofing and acoustical solutions, including their work all around New England and Boston. They were interested in the products, solutions, and cost factors that soundproofing had for the condo owners. To see the article, click here or purchase an August issue today! Here is a great article featuring New England Soundproofing in The Bates Real Estate Report, about how realtors, home owners, and new home buyers should look into soundproofing. The Bates Real Estate Report is a well-respected realtor blog, based out of Boston, MA. It features the most high end real estate in Massachusetts. Click here to see the article. For more information, testimonials, and new articles on New England Soundproofing, check back on our website for updates. “Dear Mr. Drago, Thank you very much for the super job well done on the soundproofing my condo wall. I am impressed by materials and construction. It is the best solution for people living in condo’s with extreme noise. All the best for your company.” To see what we did for her, Click Here or the picture above!